Human beings are social animals. They crave for friendship, relationships and emotional support in every phase of their lives. Positive and healthy interactions give food to man’s intellect. Healthy relationships boost creativity and flexibility. Good work relationships are very important to stay focused on your job. You also get space to nurture your skills and better opportunities for career growth. You need to work on building a good working relationship with your boss, teammates, customers, suppliers and key stakeholders. On your first day, greet people warmly. Maintain eye contact and refer to people by their name. A simple ‘Hi’ is the stepping stone of a good professional relationship. Trust is the foundation of all healthy relationships. You and your teammates should support each other to complete any project. Once you and your team start bonding, communication becomes easy and effective. Both sides should be able to express their thoughts and opinions openly. You should respect the people of your team. As a new employee, you should patiently hear their inputs and ideas. When you show respect for your colleagues, they openly accept you. Teaming up becomes easy. They also ask about your inputs and insights. In this way, you and your co-workers can find better solutions for a project. As a new employee, you should show your willingness to learn from your seniors. Initially, you can face many challenges and difficulties in a different work atmosphere. Appreciate the efforts of the coworkers who come forward to help you and give you valuable inputs about the work culture. If someone is performing very well, compliment him genuinely. These gestures can open many doors to a solid relationship with your colleagues. You face many challenges in your new role. First few days you may need the guidance and support of other teammates, but remember they also have some other work on their shoulders. Do not depend too much on them. Do not hang around their cubicles when they are busy with some other person. Wait till they finish their phone conversation. Ask only what you need. Do not ask casual or personal questions, while in office. You should maintain a line between personal and professional life. You should be able to accept different opinions within your office. Many times, there can be differences of opinion with your colleagues, but you should not challenge it aggressively. Be patient and consider all pros and cons of the proposals. You should also accept the diversity of culture in your workplace. Stay out of office politics. It can hamper your growth as a professional. If you are having any conflict or difficulty with any person, do not crib or complain about it inside your office. It can ruin your impression as a person in the workplace. Your colleagues will not trust you.Before you join a new company, improve your EI (emotional intelligence). It will help you understand the emotions and needs of your seniors and co-workers. Always be positive. Your positive vibe can make you a winner in your new job. Constant travel makes packing difficult, but these products can make your on-the-go lifestyle much more efficient. You know you’re a tech traveler when your dongles are spilling out of your suitcase. Sometimes it may even be difficult to find a place to plug in these dongles. 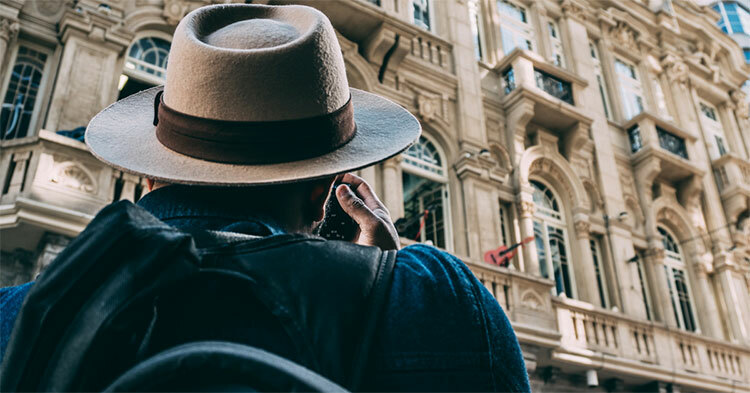 We compiled a list of products that ensures that your tech traveler lifestyle is up to par as well as enhances your experience, wherever you may be. 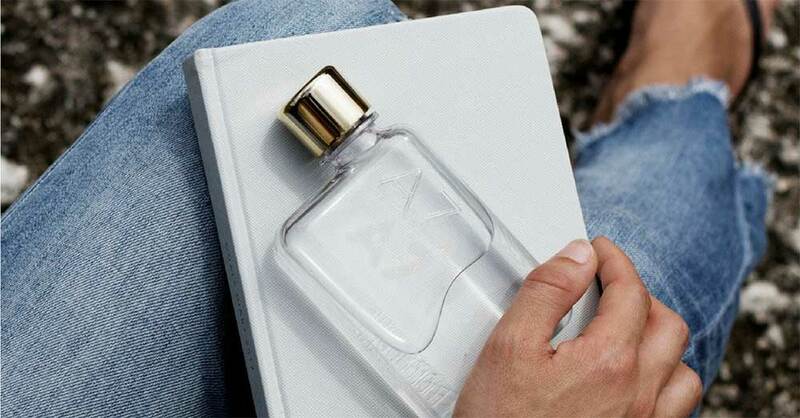 Memobottle is a water bottle designed to fit perfectly between your books or laying flat against your laptop. This rectangular, flat bottle design is sleek and is sure to spark some conversation. Slide your bottle into your briefcase or laptop bag without having your bag become bulky, which is a lifesaver when you're a fellow tech traveler. Memobottle is a sustainable alternative to disposable plastic water bottles. It is stylish and durable, making it an essential for everyday use. Because of our need to be connected, we may need to charge a bunch of different devices at the same time. 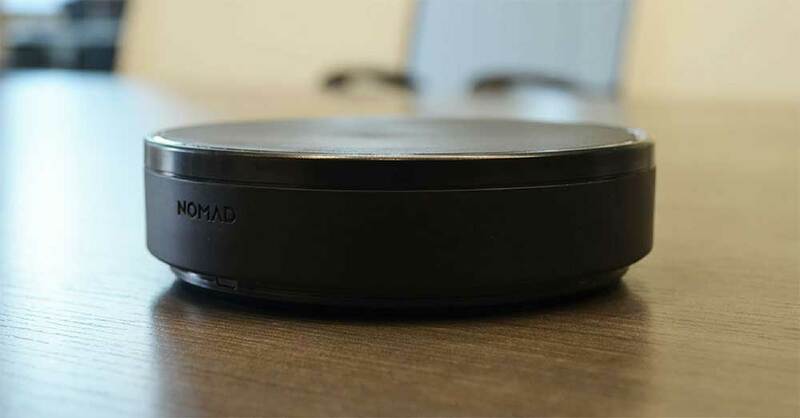 The Nomad USB Charging Hub is sleek in design and fits perfectly into your environment. The charging hub is perfect for every tech traveler. You can charge up to five devices in one place, relieving you of the stress of searching for multiple outlets. The flat surface allows you to rest your phone or iPad on top. The Charging Hub also has an ambient light sensor that dims the LED indicator in the dark, allowing you to sleep peacefully. What makes the Raden suitcase unique is the technology they integrated into the suitcase. Think about some of the basic fears we now have when flying: losing our suitcase, having to pay extra fees, or running out of batteries on our phone with no outlet available nearby. The Raden suitcase solves these three concerns with their app. We may be able to fit everything we need into a conventional suitcase but usually forget about the weight. Well, the Raden suitcase is its own scale. After connecting the suitcase to the app, lift the handle of the suitcase to find out the weight and avoid overweight fees. With bluetooth technology, the app will notify you when your suitcase is nearby. No more fighting with other travelers for space circling the carousel watching as each bag falls down from the entrance. Stand back and let your suitcase tell you when it is coming.Running out of batteries has become one of our biggest fears - especially if being connected is a part of our job. Well, the Raden suitcase is here to save you if you miss your connection or spent too much time playing games on your phone and now need a charge. There is a built in USB charger port right behind the handlebar that can completely charge up to four phones. Plug the charging wire into the battery without removing it to charge up the suitcase or remove the battery, charge it and used as a portal changer once you have reached your destination. This suitcase is a combination of old and new. 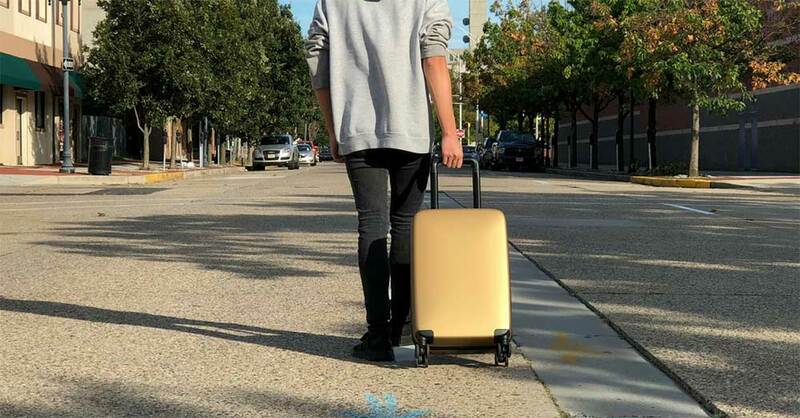 The Raden suitcase has four 360 degree wheels. Their use of polycarbonate shell allows the suitcase to be durable against TSA throwing your suitcase around, but at the same time is lightweight and smooth. The zipper is reversed, making it water resistance, great for keeping your belongings secure and dry when traveling to rainy destinations. As we become more dependent on technology, besides a cell phone, a laptop is the next most important device to keep us connected and get our work done - especially those in the technology field. 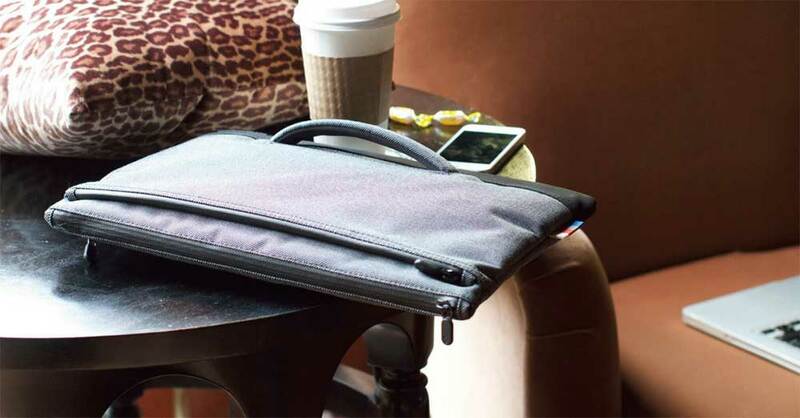 A prime investment for our previous laptops is the Lexdray laptop case. The case is “ultra paddled” with fleece lining for their main compartment as well as the two side compartments for chargers and other essentials. The water repellent zippers are great for running from house to car, car to building, building to restaurant without worrying about our electrics getting wet. 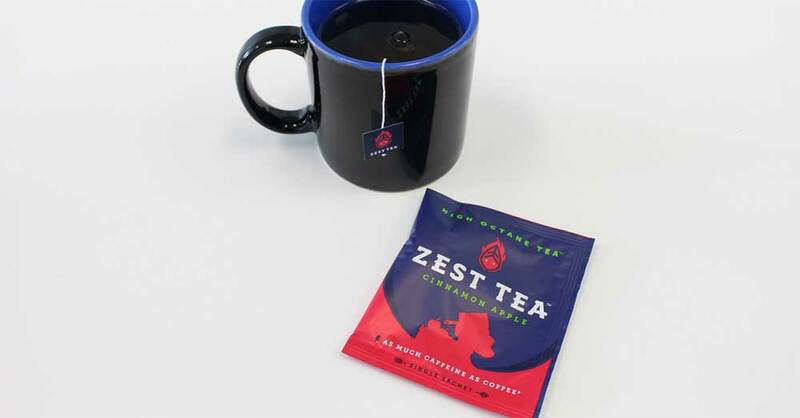 To get that boost of energy and focus you are craving for without the crash, try Zest Tea. They currently offer four flavors from something simple like earl gray black tea to something bold like pomegranate mojito green tea. Each flavor of Zest Tea is highly fragrant, and drinking it leaves you feeling instantly refreshed. This is especially important for the tech traveler who is awake at all hours of the day, going from place to place.Once you hit a certain age, highly caffeinated beverages are your best friends when we need a bit of extra energy. It becomes a necessity. You get the energy boost you are looking for but it comes with a consequence. You become jittery, especially when you are lacking the drink, and you crash once the caffeine wears off. Zest Tea gives you the energy you need without the uncomfortable side effects. Technology has consumed our lives for better and for worst. Before smart phones and social media became such an essential part of our lives. Going back to the old school way of pen and paper allows us to disconnect from the world and have a moment to ourselves: right here, right now. 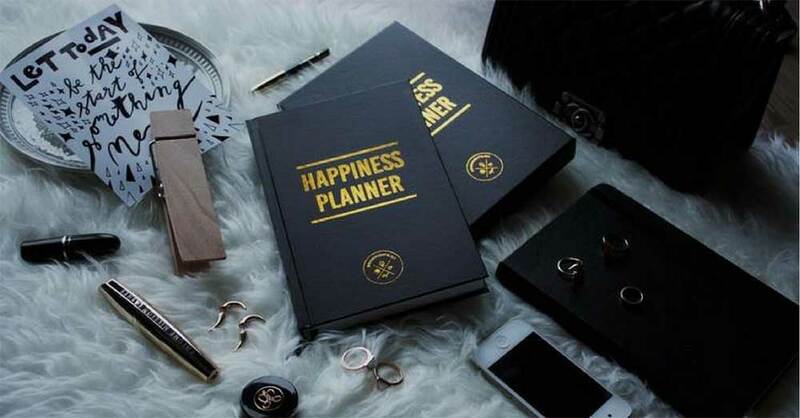 The Happiness Planner is laid out in a way to help you take a step back from technology and focus on simpler things in life that makes us happy. Each morning, start off by thinking about what excited and inspires you. A positive mindset will set your day in a good direction. As you are writing, more ideas will come to you and before you know it, you are have the right attitude to conquer any difficult task that may come your way. At the end of the day, reflect on all the good things that happened that day. You will realize that this world isn’t as bad as the news makes it seem. There are five key elements of emotional intelligence: self-awareness, self-regulation, motivation, empathy and social skills. Awareness and practice of each element combined will make our daily lives in and out of the workplace much more enjoyable. We go through many emotions throughout our day. Being mindful of these emotions and turning the negative ones positive will keep us motivated. We do our best work and is most approachable and enjoyable when we are comfortable. The first element of emotional intelligence is self-awareness. This is the ability to recognize and understand both the positive and negative feelings you encounter. Being able to recognize your emotions will allow you to analyze how you feel in certain situations and later allow you to control those emotions in certain situations. This is especially important in negative situations when hot emotions will cause you to make rushed decisions and say things you do not fully mean and cannot take back.You go through many emotions on a day to day basis. Take a regular work day for example. You wake up feeling like you are ready for the day or ready to go back to sleep. This can be the determining factor of how you may feel the rest of the day. For the next couple of days, notice how you feel when you first wake up in the morning for work. Are you excited to see what challenges you will resolve today or are you dreading the thought of stepping into the office? If you are excited, congratulations! This means that you are enjoying your work and feel a sense of pride about what you are doing. If you are dreading going to work, pause for a second. Why are you not looking forward to your day? Is it because of your coworkers? Managers? Or is it because you do not enjoy the work you are doing? Evaluate why you are not looking forward to your work day. Figure out if it is something you can change, how you can change the situation, and go from here. After being self-aware of your emotions, you can begin self-regulating them. Self-regulation of your emotions is the ability to control the emotions, especially in high-stress situations. This will help with lashing out impulsively when in stressful situations.An example that ties in with self-awareness at work is how you respond to certain people. Are you responding to certain people in a more negative way than others? This is an important thing to recognize. The person you are responding to negatively is picking up your negative energy much faster than you are recognizing it yourself. Take a moment to notice when you feel more worked up when talking to a specific person. Figure out why that is the case. It may be something they said once that is stuck in the back of your brain. Figure out what it is and determine if it is worth holding a grudge. In most cases, nothing is worth holding a grudge. The only person it is affecting is yourself. After you have determined why you speak to this person in a negative way, let yourself know it is not worth having tense at work and let it go. You are with your coworkers more than you are with your friends so why not be happy when you are at work. There will always be days when we feel unmotivated to crawl out of bed let alone do anything productive. Sometimes the lack of motivation comes from something as simple as lack of sleep or as complicated as lack of passion. Go to bed earlier! More sleep cannot hurt. Lack of passion can be fixed. Often time, many life elements plays a role into whether we can change what we are doing out of necessity into doing what we want to do out of passion. 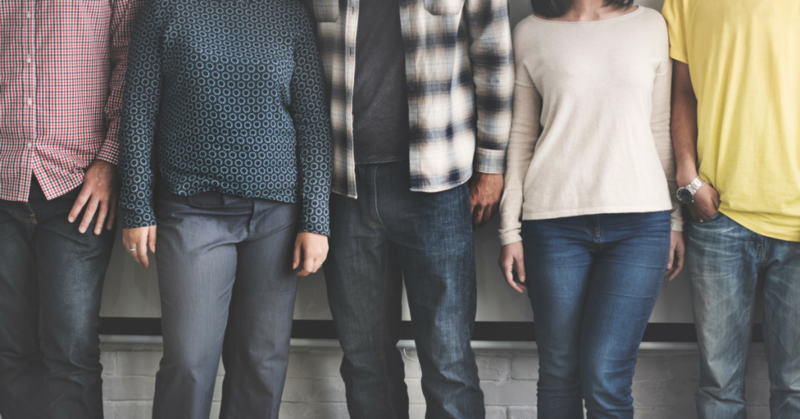 Being self-aware of why we are lacking the motivation is the first step in getting motivated, however, we do not always have to do it alone.We interact with many different people in our daily lives - family, close friends, coworkers, random person on the same train as us every day. Every one of those people could use a boost of motivation from time to time. In the workplace, whether you are a manager or team member, it is undoubtedly recognizable when someone is lacking the motivation. They are your work family. You see your coworkers more than you see your actual family so a shift in behavior or attitude is easy to pick up. When you notice these shifts, if it is a negative shift, consider what might be the cause. If it is something work related? How can you support or work with them to help? As a manager, are you listening to your team? Is someone feeling burnt out? Is there something in the business process that can be improved? Improving all of these things will improve the morale of your team and motivate them produce more high quality products. The other elements that we have discussed so far were about recognizing and understanding our own emotions. Empathy is different. Empathy is being able to recognize and understand the emotions of others. It is often time easier to recognize the emotions of someone else, especially if it is a negative emotions. You just have to pay attention. This ties in with self-regulation when we talked about others being able to pick up on the energy we give them. Although it is easy to pick up the emotions of others, it is important to consider why they are feeling that way.When others are feeling positively, it is something to enjoy. If they are feeling extra enthusiastic or high in energy, maybe something exciting is going on in their lives. Maybe they’re about to go on a dream trip and is looking forward to it. Feeling the positive emotions of another person will feed our emotions positively. Ask that person what is making them so excited today. You might have just discovered something fun to talk and bond about.Now for the not so fun emotions. Negative emotions are more difficult to control. We feel our blood boiling, the looks in our eyes changes and our body language may become aggressive. Most people will stay far away from people they see are showing signs of negative emotions. Why? Simple. Because we ourselves do not like to feel negatively and do not want others negative emotions rubbing off on us. However, stop and consider how you feel when you are upset. At first you may not want to be disturbed by anyone but you should know that holding in negative feelings for a long time is not healthy for yourself or anyone around you. Sometimes, people just needs one caring person to take them aside and ask if they are okay.The answer could be simple. They may have just had a bad start to their day. Spilled coffee for example. Other times, they may be going through a difficult situation in their personal lives that is spilling into how they feel at work. These situations are more difficult to help with but knowing that will allow you to be more empathetic when they respond harshly to a question you ask or seem spaced out.The situations we have just talked about were seeing a higher level of energy - positive or negative - different than their everyday level. Another thing to consider is culture or personality traits. Someone’s culture is a big factor in how they preserve a situations and how they will handle it. Personality traits such as introverts vs extroverts will also react differently to the same situation. 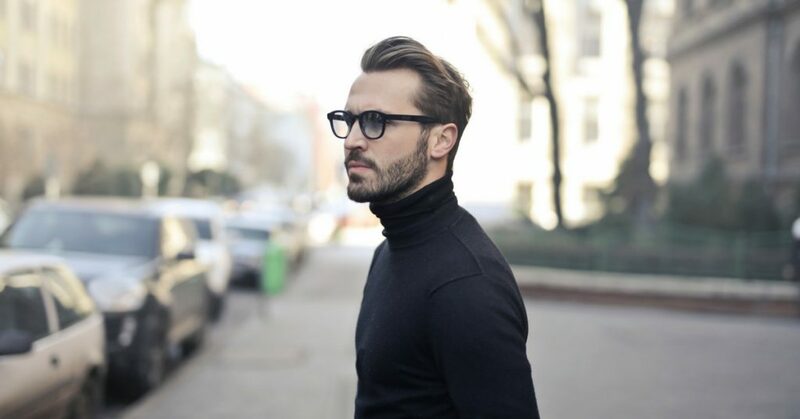 Do a quick search for personality tests online and see what you are. Most people are close to the middle. Someone who is introverted, may preserve an extroverted reaction as extreme. Understanding and educating ourselves about our personality traits and what others are will help the us understand how to react in certain situations and with certain people so that everyone feels comfortable. Understanding all of the above elements, recognizing when we feel certain ways, controlling those emotions in negative situations, motivating ourselves and others to be in a positive mind set and understanding the emotions of those around us, will improve our social skills. Another way of improving our social skills is being able to read the situation, social cues and body language. But keep in mind, body language and cues could mean different things in different cultures. Take eye contact for exam. In one culture, strong eye contact shows confidence and respect while in another culture, it is seen as trying to intimidate. Bibliophiles have no problem reading books they love because they find solace in it. Other people, on the other hand, struggle to retain their attention no matter how interesting the book is. Just like losing weight, training for the Olympics or deciding to follow a healthier lifestyle, learning to read a book a week takes discipline and determination. But that's not all. If you want to learn how to read a book a week, you're on the right page because we have tips on how you can achieve this feat. One way to make a habit of reading is to keep a book where you relax. Placing a book in a relaxing area removes any friction. You "don’t have to" read it just because it's there. Once you start reading in a relaxing area, your brain will begin to associate the reading with the area and the action will begin to become automatic. Over time, your brain will begin to see reading as relaxing and you will find yourself reading whenever you want to relax. People who love to read cannot get enough of the book especially if it's a good one. Non-lovers on the other hand will find themselves sweating when faced with a really thick book. You can stop the sweating by committing to read 10% of the book every day. So if it's a 1000 page book, commit to reading 140 pages or so and you'll be done in a week.Another way to break it down is to commit to time. If you want to read a book a week, set aside a specific amount of time and read uninterrupted during this time frame. You can set aside 45-60 minutes per day to read a section of a book before going to bed. If you can spend 40 minutes per day reading your newsfeed, you can do this by reading a book. There are readers who want to read biographies, others non-fiction while others love their romance novels. It doesn’t matter what you read as long as you read what you want to. Don’t be pressured by other people. 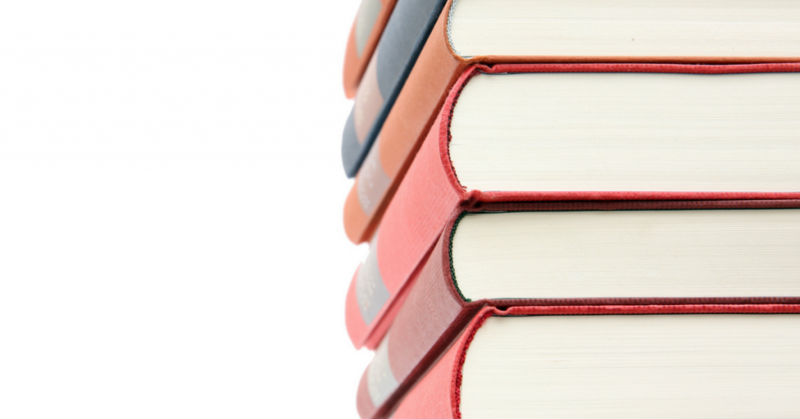 Reading should be an enjoyable experience and not all people experience a book the same way. For example, there are people who do not find non-fiction books interesting. There are also people who love to read adventure books because it allows them to go on an adventure vicariously. By reading what you want to read, you are creating your own enjoyable experience and learning things that you find interesting. Yes, thrillers are exciting but they can be boring if you read one after the other. Don’t be afraid to explore other genre like the classics, horror, biographies, non-fiction, documentaries and others. Find out what's on the New York Time's Best Seller's list and see what's the top book for fiction, non-fiction, e-books and challenge yourself to read these books. Exploring will help you identify the different kinds of genres you like and help you find topics that you find interesting. One of the reasons why people find it hard to read is because they are distracted. Once their phones ping to herald an email or social media notification, they instantly stop what they're doing to check their phones. TV shows, responsibilities and children are also good distracters. However, if you really want to read a book a week, find a setting that does not have distractions to let you read uninterrupted. By choosing a distraction-free setting you will be able to stick to your goal of reading a book a week. For example, you designate one hour before bedtime for reading. Make sure that your kids are already asleep and chores are already done before starting on your reading.Reading a book a week enables you to read 52 books a year! Isn’t this amazing? Books are not only relaxing, they are also empowering. You can learn new ideas, cultures, ways of thinking and explore faraway places by reading a book. All it takes is commitment and you can explore the world of books without having to leave your home.